After the credits, the film opened during a training session, taking place presumably in the exterior of space, but it was only a practice session in a flight simulator with a primate named Pericles. His trainer, US Air Force Captain Leo Davidson (Mark Wahlberg) stepped into view and uttered the first words: "You lose" to the chimpanzee, because he had changed the chimp's flight sequence and it couldn't adapt. They were on board the USAF Oberon research space station in the year 2029. He walked his favorite simian co-worker past cages - the living quarters of other chimpanzees where a sign read: "CAUTION LIVE ANIMALS." While Leo, now two years into duty from Earth, was receiving an electronic 'postcard' from well-wishers, an approaching electromagnetic storm caused a brief power outage. He reported to the piloting commander's bridge, entering a security door with a shatter-proof glass barrier by inserting his hand into an ID system. Crew members told him that an electromagnetic cloud storm was moving through space and causing anomalies, including broadcasts of every electronic communication from Earth - from all time! Commander Vasich (Chris Ellis) called for the Alpha space pod, piloted by Pericles, to pass through the storm's central core and take initial radiation and gamma-ray readings. The pod with the chimp headed into the eye of the storm - went off-course, and then inexplicably disappeared. Disobeying orders from his commanding officer, Leo replied: "Never send a monkey to do a man's job," and took out a second Delta space pod for an unauthorized flight - and also disappeared in pursuit of Alpha pod and Pericles. The caravan of carts were hauled to a city of apes, and as they arrived, Davidson asked "Where am I? What is this place?" but the scared woman next to him (Linda Harrison, who played Nova in the first two films) shook her head "No" at him, cautioning him not to speak and to remain subservient like everyone else. The enslaved humans were taunted by young boys in the street who threw stones at them, and cautioned by 'human' rights activist Ari (Helena Bonham Carter) to not be cruel to the new batch of slaves, although she was derided as a "human lover." The cartload of humans were delivered to exploitative slave trader orangutan Limbo (Paul Giamatti) who called the group "the skankiest, scabbiest, scuzziest humans I've ever seen." The males were separated from the females - it was reported that they had been caught for raiding the fruit orchards of the apes. Ari was disgusted by the apes' treatment of humans: "Demeans us as much as them," witnessing how General Thade purchased a little 5 year-old girl (Callie Croughwell) human as a 'pet' for his niece, and led her away on a leash. As branding irons were being used to mark the humans as slaves, Ari interrupted the procedure by grabbing the iron: "I just can't stand by while human beings are being mistreated, tortured, mutilated." She was allowed to be a 'do-gooder' against Limbo's "filthy business" because she was the daughter of influential chimpanzee Senator Sandar (David Warner). She believed the humans were not dumb: "They can be taught to live with us as equals," she claimed. She decided to buy both Leo and "wild" Daena to work as slaves in her own household, in order to save their lives and prove her point. They and two other "house humans," Tival (Erick Avari) and Bon (Freda Foh Shen), were supervised by a large, elder silver-backed gorilla named Krull (Cary-Hiroyuki Tagawa), an ex-Ape Army General who opposed Thade and had his career ruined. At a society dinner party at gray-haired Senator Sandar's home, Leo and Daena served as house/kitchen servants. The guests included elder statesmen Senator Nado (Glenn Shadix) and his younger vain chimpanzee wife-mistress Nova (Lisa Marie). General Thade arrived late and complained about the quickly-breeding humans that "infest the provinces" on the outskirts of ape civilization, outnumbering the apes four to one. Ari prompted her father to mention that the tactics of the army were too extreme, and militaristic General Thade retorted: "Extremism in defense of Apes is no vice" (a bastardization of Senator Barry Goldwater's controversial 1960 presidential campaign statement). Although Ari claimed that humans were skilled and "capable of a real culture" (she held up her embroidered scarf as proof), Thade objected: "Everything in the human culture takes place below the waist," and Colonel Attar accused her of flirting with blasphemy. Before eating, Attar demanded a prayer to Semos, their "Holy Father who created all apes in his image." There was some embarrassment when Ari left the table, claiming that she had lost her appetite. The ambitious General Thade visited Ari in her bedroom, where he admitted his feelings for her, but she said he was wasting his time. He threatened that he had the power to arrest her because of the trouble she was stirring up, but she grunted at him: "I'd do it again." He was contemptuous of her love for humans: "You feel so much for these humans, yet you feel nothing for me." When locked up for the night with the other humans, Leo picked the lock with a stolen knife and escaped from the cage, and also freed the others. Daena agreed to lead them back into the jungle where they were caught, but only if they also rescued her family along the way. They had to avoid an overnight curfew as they fled into the street, and crept up on the human pens to rescue injured Karubi, Daena's father, Gunnar (Evan Dexter Parke), and feral boy Birn (Luke Eberl). As they fled from Ape City, they had to run through a crowded quadrangle of apartments, including the bedroom of Senator Nado and Nova (delivering a chest-pounding mating call), the apartment of an elderly bald ape, and the bedroom of Thade's niece with the kidnapped 5 year-old Little Girl. Squads of guards pursued them, but they were surprisingly intercepted by Ari, who offered (because she thought Leo was "not usual") to take them back to the house and reason with the apes. He offered her a deal: "Show me a way out, I promise you I'll show you something that will change your world forever. Trust me." She pondered the idea and then accepted, knowing the danger of joining his cause: "I can show you the way." In pain from his wound, Karubi decided to sacrifice himself to ensure everyone's escape - he bravely charged forward at Colonel Attar, who had spotted the group, and heroically attacked with a flaming torch as a spear. Attar grabbed him and broke his arm, and from behind, General Thade slashed his body with a sword and killed him. Thade then ordered Attar's apes to follow and kill all the humans - "except for the troublemaker. I wanna talk to him before he dies." Attar revealed that the Senator's daughter was also with the group of humans - "she's helping them." Thade reinterpreted the news: "She had no choice. They threatened her life," and said he would report the kidnapping to Senator Sandar. Thade used the opportunity to manipulate the Senator into loosening restrictions ("Untie my hands") and declaring martial law: "Give me absolute power to rid this planet of the humans once and for all. Now is not the time to be timid or indecisive." Shortly earlier, General Thade had been led by two gorilla soldiers into the jungle, where they showed him strange evidence: "Something fell from the sky with wings of fire" - they followed a charred path through the undergrowth, where they had heard "a thunderous sound and the ground itself shook." The treacherous Thade murdered the two guards to keep the top-secret information all to himself. At the pool of water in the jungle near the charred trajectory of his crash-landing, Leo dove into the murky bog to retrieve his satchel - and Daena followed after him. She came upon the two bodies of the soldier-apes that Thade had murdered, reacted with horror and gasped for air, but Leo pulled her to the surface. When told about the two ape bodies, Krull knew why they were there: "Someone else knows you're here." Leo removed his gun and a hand-held communications device from the satchel - he described it as "a messenger - keeps an open frequency with my ship...with radio waves." He was startled: "I have contact. Jesus, they're already here. They must be waiting for me." The device indicated the direction of the beacon signal that they should follow. He said he only had 36 hours until a rendezvous with his friends. Suddenly out of nowhere, slave trader Limbo and two assistants grabbed Gunnar and Birn, claiming them as escaped property. Leo fired his gun to scare off the assistants, and they took cringing Limbo as an unwilling, hand-cuffed hostage when Ari argued to keep him alive: "You kill him, and you'll only lower yourself to his level." As they proceeded, Leo explained how humans kept the last of the remaining apes (who couldn't talk) in zoos where he lived, and although he admitted that humans were intelligent, he observed: "The smarter we get, the more dangerous our world becomes." Ari was impressed by his uncharacteristic male sensitivity, causing something of a jealous rivalry between Ari and Daena for his romantic interest. On the crest of a rock outcropping, the group of humans came upon a collection of monstrous ape scarecrows or effigies posed on poles - to scare and prevent anyone from crossing further. On the other side of the hill were the sacred ruins at Calima. According to the apes' holy writings, that was where creation began: "Where the Almighty breathed life into Semos, the first ape, in the time before time." Krull added: "It is where Semos will return." Ari speculated that the creation story was probably a fairy tale or metaphor: "I doubt if there ever really was a Semos." They pushed on to Calima, because Leo's device indicated that his crew was already there [the twist was that they had been there for a LONG time! ], although they first had to pass, after darkness fell, through a river camp or outpost of ape guards housed in brightly-colored red tents. Colonel Attar arrived at the encampment to bolster the defenses of the incompetent Ape Commander in charge, by assuming command. Leo's plan was to steal horses from the camp's pen, ride directly through the encampment, and cross the river to reach Calima. He shot a flare into the night sky before they all stampeded into view on horseback, burned and tore down tents, and galloped to the river. The plan succeeded, except that Leo had to carry Ari, with an instinctive fear of drowning in water, on his back across the river, as the apes vainly hurled fireballs at them. After learning of their successful escape, General Thade called for marching divisions of apes to converge on Calima. At the ruins of Calima, thousands of years old (according to Ari), Leo and the group ran inside, although they found it was deserted. Gunnar commented on the obvious observation: "They're not here. They were never here." Daena was worried: "You said they'd come for us." On a concrete wall, Leo saw the words: "CA-LI-MA" but it turned out to be the warning sign reading: "CAution LIve aniMAls" when he dusted away the sand. He turned and noticed the animal cages of his former space station The Oberon. Calima, the "forbidden" holy site of the apes, turned out to be the crashed ruins of the USAF research station, which had crashed on the unknown planet's surface. He exclaimed: "Oh, no. It's impossible...It's my ship." Further inside, he found the bridge security door (covered with a shatter-proof glass barrier) with the hand ID system still intact and operable. Using the ship's nuclear power source on the bridge, he plugged in his device and activated the control panel to access the database and view its visual log "to figure out what happened." He saw the "Mayday" transmission sent by Commander Vasich before they crashed, and then another message after they had crashed: "We were searching for a pilot lost in an electromagnetic storm...We haven't had any communications since we crash-landed. This planet is uncharted and uninhabited. The apes we brought along have been very helpful. They were a lot stronger and a lot smarter than we ever imagined." (The transmission dissolved into static and then came on again, possibly many years later. It was spoken by Lt. Col. Grace Alexander (Anne Ramsay), the Oberon's chief medical officer and one of the ape trainers.) "The apes are out of control. One male named Semos, who I raised myself, has taken over the group. We have weapons, but I don't know how much longer we'll last. Maybe I saw the truth when they were young and I wouldn't admit it. They were good students and...(sounds of screaming)." Leo had learned that the Oberon went searching for him, but because the vortex pushed him forward in time, they couldn't locate him. The space station crashed on the planet hundreds of years before he did. 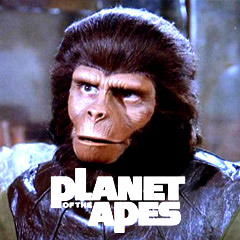 After the crash, one of the more intelligent apes, named Semos [an anagram of Moses], led a violent mutiny and took control of the vessel and its occupants in a siege. The descendants of both the humans and Semos became the peoples of the planet, divided into two groups: human slaves and militaristic ape leaders (the lineage of Thade). When they emerged from the ruins, large numbers of human tribe members converged on them, carrying their belongings and some weapons, after journeying there long distances from their homes - Tival explained: "They all want to see this human who defies the apes." On a scouting excursion by horseback, the feral boy Birn saw of line of torches in the darkness - legions of apes in battle gear approaching. Krull knew what that meant for Thade: "The senate has capitulated. He answers to no one now." Leo's plan against insurmountable odds was to have the humans break up and scatter, and he would draw them off. But they were unresponsive and couldn't understand that "there's no help coming." Ari visited Thade's nearby encampment to submissively bow down to him ("To be with you") and to propose a trade ("Yourself for the humans"). She offered herself: "I've been mistaken. Forgive me." He asked: "So you want to be human? Then wear their mark," and he cruelly branded the palm of her hand with a hot iron. He then allowed her to return to the humans: "She can die with her friends tomorrow." Leo was determined to fight back and not "award cruelty with power" and then had an idea while sitting at the bridge's dirty controls - viewing the gauge of the third full fuel cell. His "one shot" plan was to draw the apes in close, while the humans were partially hiding behind the ruins and a small group (led by Daena) on horseback would be in front of the ship serving as bait. He announced to the passive human group to rally them: "This is the day you get to stand up to the apes." But Krull was less confident about the outcome of fighting Thade: "He'll keep coming for you no matter what." As the first wave of apes loped forward and attacked, the plan worked, except that Birn (against orders) in the front line was trapped under his horse and needed to be freed and rescued by Leo. Delayed unexpectedly, Leo raced back to the ruins as the apes closed in on him, and then activated the ship's engines with his messenger device to explode the third rocket fuel cell. Many of the apes in the first wave were vaporized and burned by the blast. After the dust cleared, the humans rushed forward to beat and kill the surviving apes. General Thade ordered another wave of troops to attack, and joined the fray himself. The two great gorillas, Krull and Attar, also viciously confronted each other, and Krull was killed. Gaining the upper hand, Thade fought fiercely against Leo, when hostilities were abruptly paused with the loud sound of a sonic boom and a rocket approaching. The Alpha pod landed in their midst and the hatch opened, revealing the pilot to be Pericles, the astronaut chimpanzee, who had successfully come "home" to Oberon. Attar mistakenly interpreted the arrival as the prophetic return of their sacred creator god, Semos, the first ape, and all the apes dropped to their knees. When “Semos” was friendly with Leo, Attar immediately assumed that humans were non-threatening, and the fighting ceased. Upset by the sudden change of events, General Thade chased Pericles and Leo (possessing his chimp's backpack) into the ruins of the Oberon, where he swatted Pericles against a wall and broke his leg (the chimp then crawled into his old animal cage in the lab). The two both fought for possession of the laser handgun from the pack - and although Thade grabbed it, he didn't know how it functioned. When Thade - inside the ship's bridge - soon was threatening everyone with the gun, Leo inserted his hand into the imprint ID system, protecting himself from gunfire when the shatterproof security glass descended between them. The shots ricocheted around the pilot's deck where Thade was locked in and trapped. Attar was caught between showing allegiance to his commander Thade (ordering him to kill Leo) or listening to Leo's explanation: "This is where you're from. We brought you here. It's the truth. We lived in peace together. It was Semos. He's the one who killed everybody." Attar believed Leo, telling Thade: "Everything I have believed is a lie. You and your family have betrayed us. I won't help you anymore." Thade was incensed and fired the gun wildly, but to no avail - and eventually crouched huddled under the control panel. Outside the ruins of Calima, the graves were left unmarked to allow mourning for all the fallen - both apes and humans. Leo decided it was time to take a chance and get back home, leaving the 'planet of the Apes' when the pod beeped with the coordinates of the storm that had brought him there. He had made up his mind to leave, and before departing received a heartfelt goodbye from Ari before they kissed: "One day, they'll tell a story about a human who came from the stars and changed our world. Some will say it was just a fairy-tale, that he was never real, but I'll know." Daena also kissed him, hoping: "Maybe you'll come back." He climbed into the undamaged pod, closed the hatch, and rocketed away from the planet. The pod again entered the electromagnetic storm with light waves (and the digital year-time indicator rapidly moved backwards in time), before he orbited the Earth's atmosphere. He crash-landed in the Washington, DC area (it resembled his home planet of Earth in the past? ), in the Mall's reflecting pool, and came to rest on the front steps of the Lincoln Memorial. Leo walked inside the memorial where he stood open-mouthed before the giant statue - now in honor of General Thade, with the inscription: "IN THIS TEMPLE AS IN THE HEARTS OF THE APES FOR WHOM HE SAVED THE PLANET THE MEMORY OF GENERAL THADE IS ENSHRINED FOREVER." He heard sirens wailing as civilized ape police officers in cruiser vehicles and motorcycle ape-cops pulled up and held him at gunpoint to arrest him. Tim Burton's remake was a reboot of the series after the original and four sequels (from 1968 to 1973). With a production budget of $100 million, and box-office gross receipts of $180 million (domestic) and $362 million (worldwide). It scored the second biggest opening of the year ($68.5 million) behind the first Harry Potter film, Harry Potter and the Sorcerer's Stone (2001), but fell fast after that. Charlton Heston's belabored and uncredited cameo on his death bed was further informed by his position as NRA spokesman - and his praise for humanity's invention of guns: "What you hold in your hand is the proof of their power - their power of invention, their power of technology." With three Razzie Awards (and wins): Worst Remake or Sequel, Worst Supporting Actor (Charles Heston), and Worst Supporting Actress (Estella Warren). The next film in the series was ten years after - the prequel Rise of the Planet of the Apes (2011), with CGI enhanced (and motion-captured) primates.